The origin of tea is said to be in China. From its origin it was considered a medicine and an antidote for poisons and toxins. A vestige of this can be seen today when referring to tea in Japanese. “O-cha o ip-puku” means one cup of tea where 'puku 服' is the counter word for medicine. Shennong, said to have lived 4,500 years ago, is revered as the pioneer of herbal medicine and the person who laid the foundation for Chinese Medicine. Shennong traversed many mountains and explored many forests in search of medicinal herbs for humans. It is said that when Shennong trailed a poisonous herb, he used the tea plant as his antidote. The founder of the Rinzai sect of Zen Buddhism, Eisai Zenji (1141～1215) is also a hugely important figure in the history of tea in Japan. Eisai returned from his second study trip the China in the second year of the Kenkyuu Era (1191). (Eisai's first study trip to China was in 1167, the second in 1187.) In the second year of the Kennin Era (1202), Eisai was granted land in Kyoto from Shogun Minamoto Yoriie to build a temple. That temple would become Kennin-ji. Following this Eisai gave tea seeds to Myoei Shonin of Kousan-ji temple (Kyoto) who would start the cultivation of tea in Kyoto. Eisai also founded Jyufuku-ji temple in Kamakura and from there spread tea drinking to Eastern Japan. Another of Eisai's achievements was to write the first treatise on tea in Japan, titled 'Kissa Yojoki’, or ‘Treatise on Drinking Tea for Health’. Eisai wrote the treatise in 1211, at age 71. 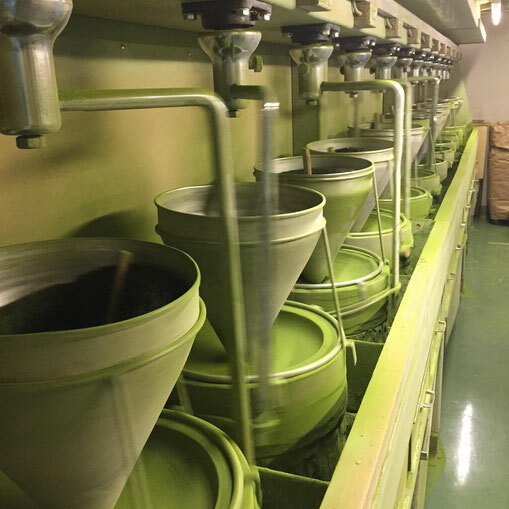 In the treatise Eisai explained the benefits of tea drinking as medicine, cultivation methods and how to make matcha. After writing the treatise he presented it to the Shogun Minamoto Sanetomo. The Kissa Yojoki was the first medical book written in Japan and was the main stimulus for tea drinking to spread throughout Japan. The Kissa Yojoki starts with the line: 'Tea is an elixir for health and long life, and is a plant that grows in sacred soil.' 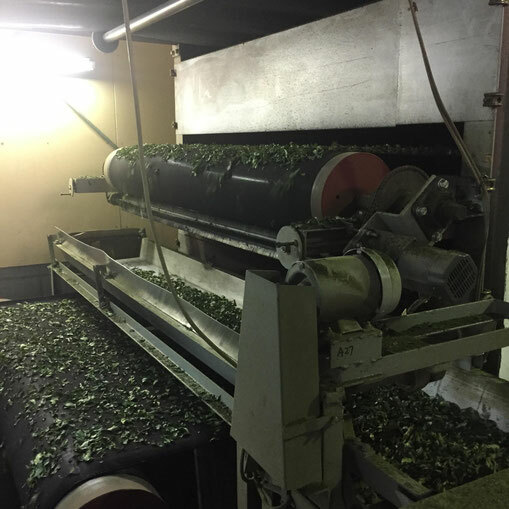 The treatise continues to explain the harvesting and processing methods for tea. The later parts of the book talks of the benefits of the mulberry plant. The Kissa Yojoki is still revered today as a seminal text on tea in Japan. 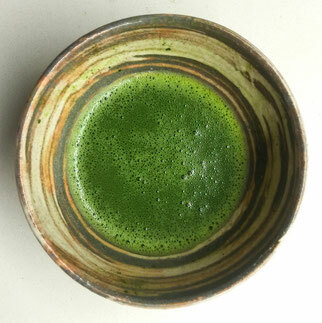 Each year for the duration of the Edo Period, new harvest tea (shincha) was transported from Uji in Kyoto to the capital Edo (modern day Tokyo) in tea jars (chatsubo). This delivery of tea was conducted in a grand procession called the "o-cha tsubo do chu" (Tea Jar Procession). The Tea Jar Procession is said to have commenced during the reign of the 3rd Tokugawa Shogun, Tokugawa Iemitsu in 1633. The procession consisted of a supervisor in chief, head tea master, two deputy tea masters, several attendants and a small army of samurai guards. Over time the number of tea jars increased and so too the number of guards. The whole procession eventually amounted to over 400 people making it the largest procession of all in the Edo Period. Being a procession of the shogunate, the Tea Jar Procession was second in authority behind the processions of the imperial family. This meant that any daimyo (feudal lord) procession from one of the domains would have to clear the road and wait for the Tea Jar Procession to pass through, should they meet along the highways. 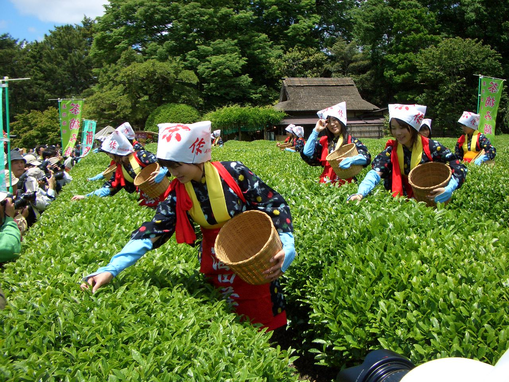 As the Tea Jar Procession would pass the attendants in the procession would shout "Shita nii, shita nii" (Heads down! Heads down!) to those along the road including townspeople as it passed through villages. Should anyone raise their head to view the business of the procession or show any disrespectful behaviour they were punished without mercy. As the country was unified in the Edo Period and with the cessation of civil war, the samurai returned to farming. As the Tea Jar Procession occurred at the same time every year as harvest time, samurai families that ordered to help with the procession were said to have known no greater hardship than dealing with their crops and the demands of the shogunate to provide horses and men for the Tea Jar Procession. "zuizui zukkoro bashi gomamiso zui, chatsubo ni owarete to wo pisshyan, nuketara dondokoshyo"
"the tea jar's coming quick shut the door and hide, when it's passed, phew, take a breath". The highways were repaired in preparation for the tea jar procession and farmers had to stop rice cultivation. Children were banned from playing outside, rock weights were removed from roofs (in case they dropped and disrupted the procession), all cooking fires were put out, and funerals were banned when the tea jar passed through. Not only did life virtually stop when the tea jar passed, it would have also been a very fearful time for people. The extravagance of the Tea Jar Procession began its decline with reform measures brought in by the 8th Tokugawa Shogun, Yoshimune. 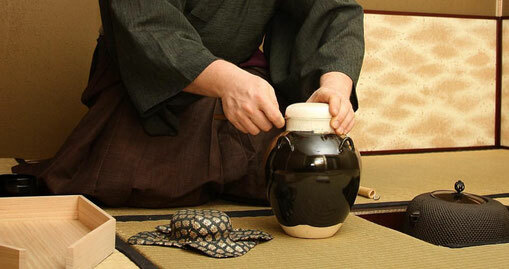 The number of tea jars from Uji to Tokyo was limited to three as one of the means for the bakufu to curb expenditure. Then with the demise of the Edo Bakufu in 1867, the Tea Jar Procession ceased after continuing unbroken for 235 years. The combination of theanine (relaxant) and caffeine (stimulant) in tea gives you a calm, sustained concentration. 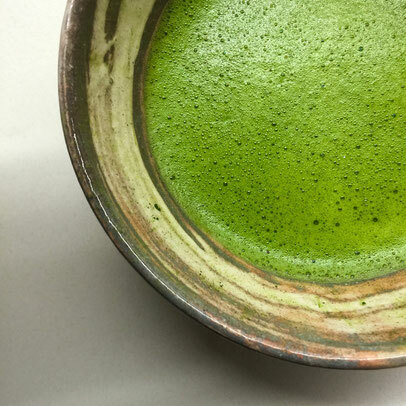 Matcha is the most potent of all teas, which is why matcha was a central element in the spiritual practice of Zen monks and samurai warriors alike. Whether in spiritual or physical training, or everyday work, matcha gives you a calm, sustained concentration to perform well. 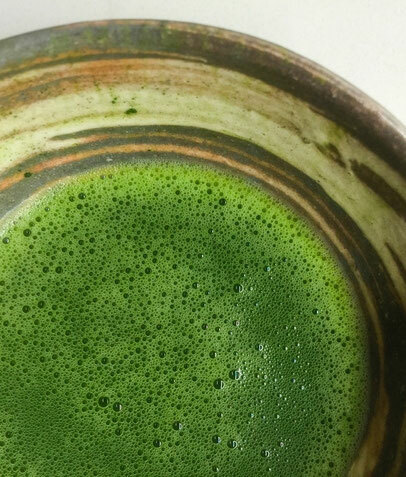 Matcha represents centuries old wisdom still relevant for our lives today. ". . . and then you drink it." Etiquette is a natural part of the evolution of tea drinking from an everyday activity, to a path for spiritual enlightenment. Repeating the same act in the same way, over and over, quickly goes from a conscious effort to a passive, selfless act of meditation. 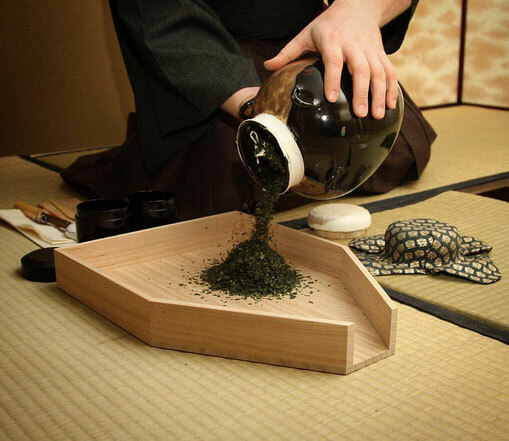 This seemingly contradictory point that one achieves freedom through form, is the reason the mundane act of drinking tea is ritualised in chanoyu. 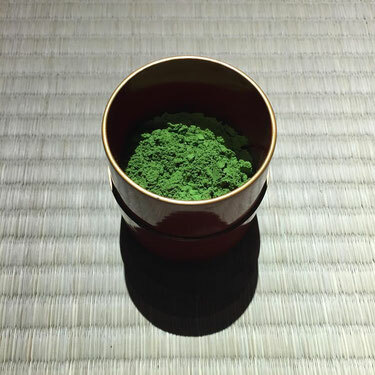 But prior to any protocol, the most important thing when drinking matcha is to simply enjoy your tea in a moment of quietude. The sensory aspects of inhaling the steam, peering into the deep green and feeling the heat of the tea transmit through the clay of the chawan are particularly important for achieving a tranquil mind. Here the introspective aspects of zen meditation are brought into the everyday, tactile world and tea drinking becomes a path linking the mundane and the transcendent. Names of varieties of tea often end in either「昔 Mukashi」or 「白 Shiro」. This is curious as they seem to have no connection to the tea they name - ‘mukashi’ means ‘past’ and ‘shiro’ means ‘white’. Nowadays these words distinguish whether the tea is koicha (thick tea) grade or usucha (thin tea) grade tea.「白 Shiro」is a recent addition to tea-naming vocabulary, originally only「昔 Mukashi」was used. 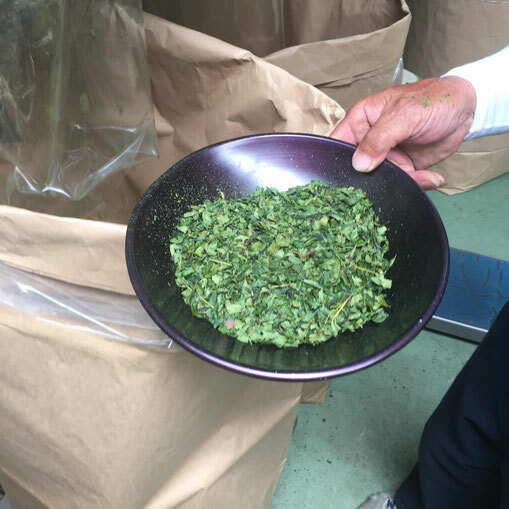 Tea that has the name 「昔 Mukashi」is of the highest quality, and is tea of the first harvest of the season. One explanation of the origin of the 「昔 Mukashi」naming convention is that the first harvest is conducted on March 20 on the lunar calendar (start of May on the current solar calendar) and this date is the origin of the name 「昔 Mukashi」as the character for ‘20’ is 廿 and ‘day’ is 日. Put them together and they resemble the character　昔. Another more widely accepted explanation is that the first harvest was conducted in a 21 day period around the ‘88th night’ (八十八夜 hachi jyu hachi ya). The 88th night is the 88th night after the first day of spring. This day is May 2 on the current calendar (May 1 on leap years). The 88th night is said to be the best time to pick tea, and tea drunk on this day is said to protect you from sickness for the year. 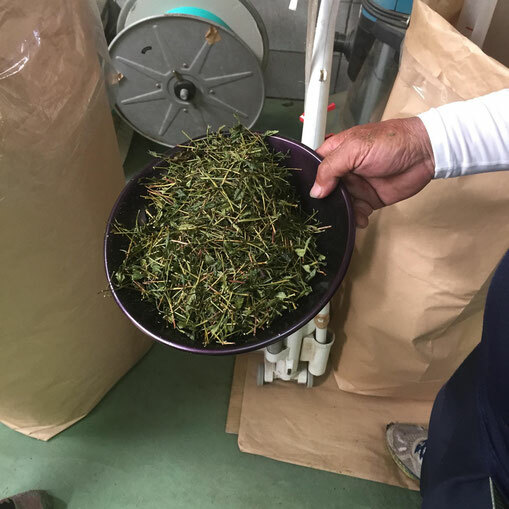 Tea picked in the 21 day period around the 88th night is given the name 「昔 Mukashi」as the number 21 is written 廿一 and day 日. Put them together and you get a character that resembles the character 昔. 「白 Shiro」in tea names appears during the reign of the 3rd generation Tokugawa shogun, Tokugawa Iemitsu (1623 - 1651). 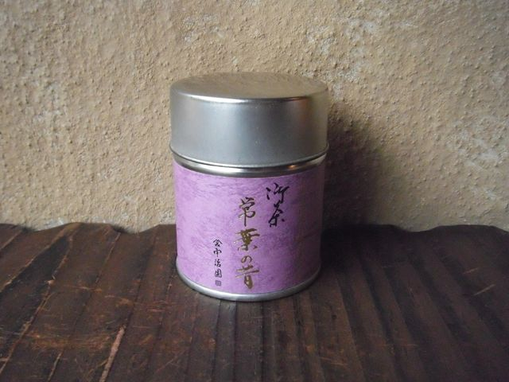 The origin comes from the requests of daimyo teaists to tea producers in Uji to produce ‘tea that is white’. The precise meaning of ‘white’ as it was used at the time is unclear. 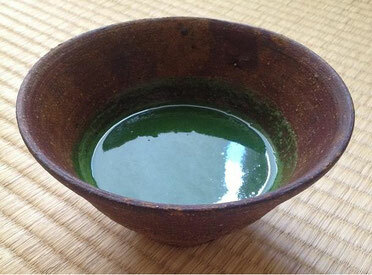 There are records of Oribe preferring 青茶 aocha ‘green’ tea, and Enshu preferring 白茶 shirocha ‘white’ tea. It is thought that what they referred to by these names were differences in the process of steaming the tea leaves after harvest, resulting in different colours in the tea. 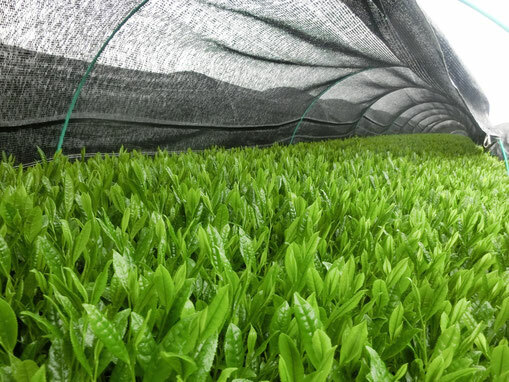 A widely accepted explanation of 白 among producers is that the young leaves of the first harvest of the year produced a light, airy tea of slighty white appearance. 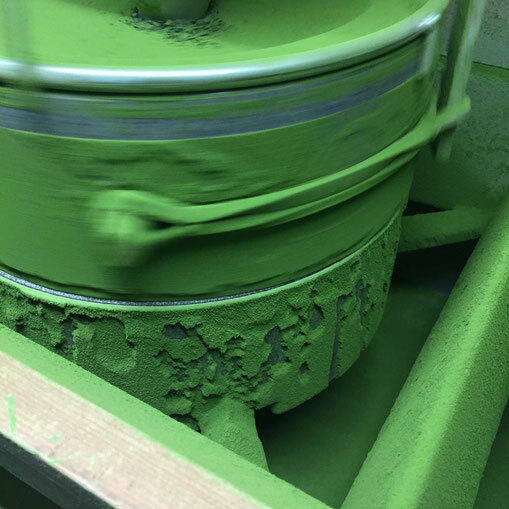 Sift matcha before whisking, no exceptions. 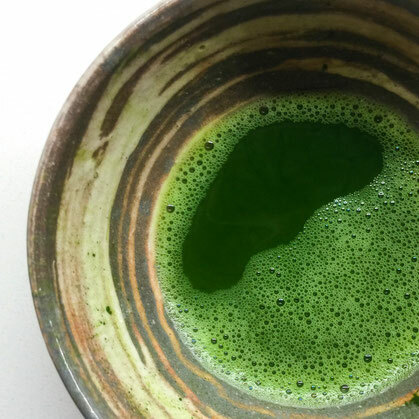 Unsifted matcha leaves lumps in the tea. 1. Thick tea: know as ‘koicha’ to tea people. Highest grade matcha. Triple the amount of tea as thin tea (usucha). Made into a runny paste. 2. 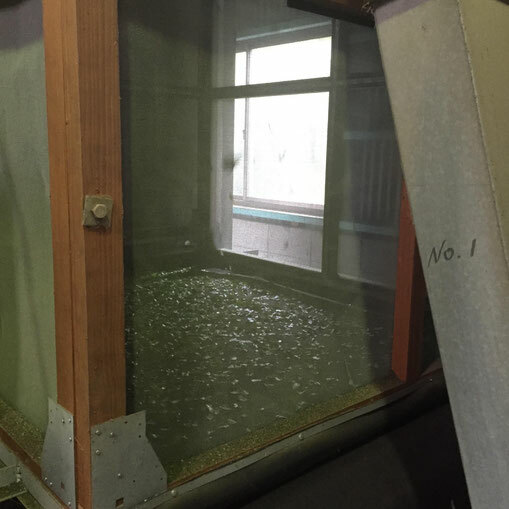 Thin tea: know as ‘usucha’ to tea people. 2-3 grams of tea with 80-100ml of hot water. Whisked so mousse forms on the surface. 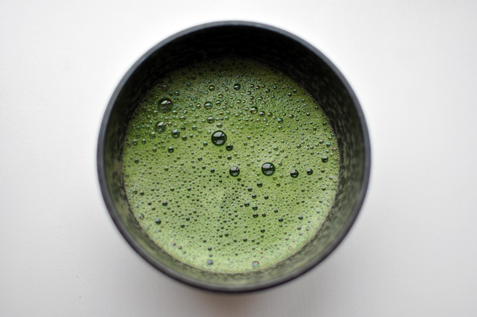 Matcha was a central element in the spiritual practice of Zen monks and samurai warriors. Centuries old wisdom still relevant today. Can there be too much matcha? Yes. If you drink too much matcha you will get a tea high. This is called ‘riding the dragon’. Don't wait. After whisking, matcha should be consumed within 3 minutes. Make a noise at the end, sipping the last of the mousse clean. Don’t leave a puddle of dregs in the tea bowl. Always hold a tea bowl with two hands. Left hand underneath, right holding the side. 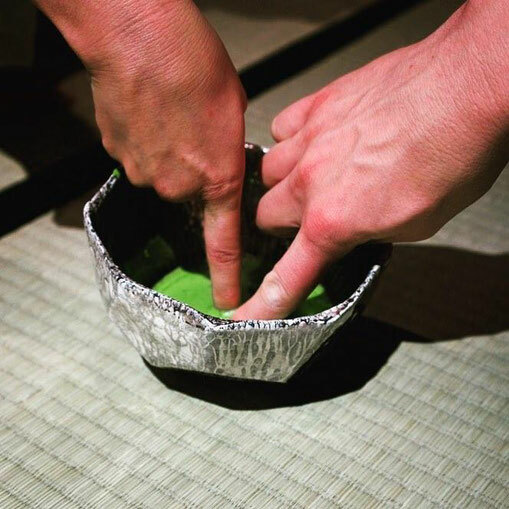 Matcha should be whisked so a beautiful mousse with tight bubbles sits on the surface. No Alien eyes staring back at you. →　strong, deep, uneven consistency of flavour. Matcha residue at the bottom from minimal whisking. 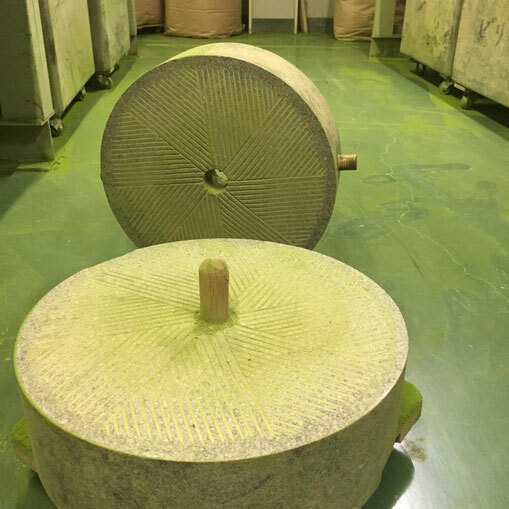 Tencha is then ground by a stone mill into matcha. 1. 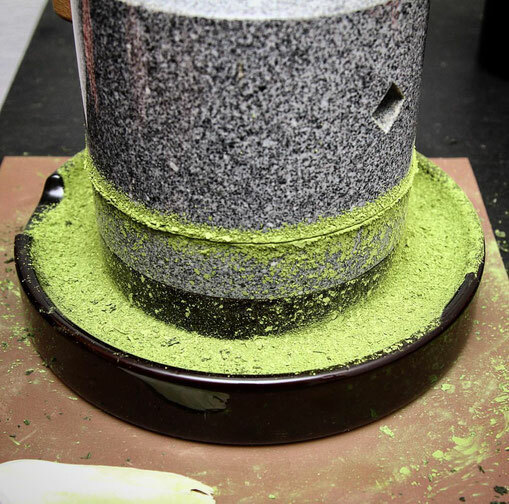 Do not use matcha to drink if the matcha has been made into powder by high speed blades and not a stone mill. High speed blades oxidise the tea due to heat. 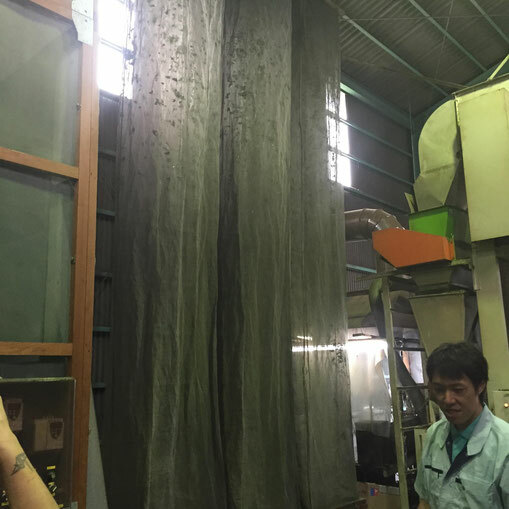 Stone mills are gentle, they do not cook the tea. 2. 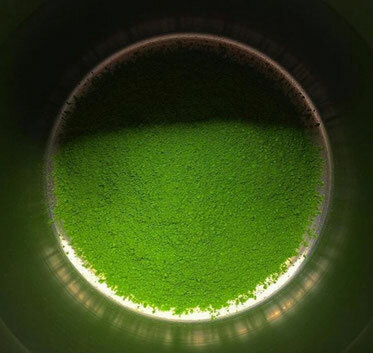 Do not use the matcha to drink if it is not first harvest (first flush) tea. 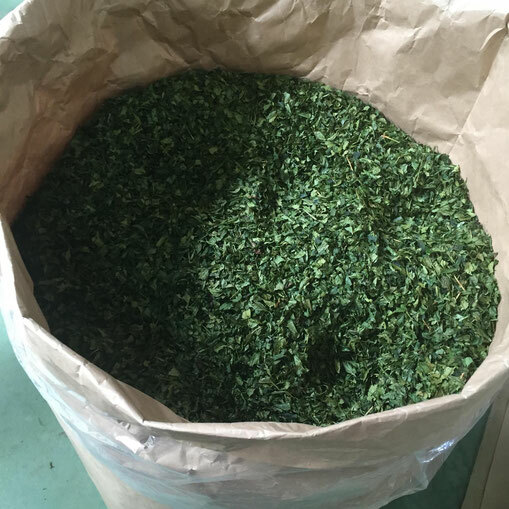 Second and third flush tea is made up of old, bitter leaves not suitable for matcha. 3. 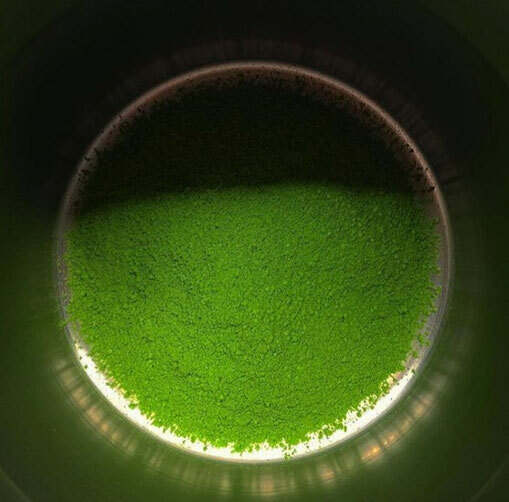 Do not use the matcha if the colour is army green or the fragrance is astringent. This usually means the matcha is 1 or 2 above. Or it can mean the matcha is old and therefore ‘off’ (oxidised). Lower the chawan to a height above your lap and turn the chawan 45 degrees to the left (clockwise). This is to show humility by not partaking tea from the face, or best part, of the chawan. The host takes the chawan, places it before them and says 'O-nomi nikū gozaimashita' (I hope the tea was not too displeasing). The guest replies 'Kekkō ni chōdai itashimashita' (I enjoyed it very much).